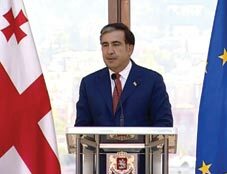 Every citizen’s right to make a free and democratic choice will be protected by the state, Georgian President, Mikheil Saakashvili said on June 25. He also emphasized that the upcoming parliamentary elections this fall would be 100% open, transparent, democratic and based on the principles of fairness and the rule of law. Welcoming the legislative initiative concerning the TV broadcasting during the pre-election period, Saakashvili promised that all political forces would have opportunities to promote their opinions for public debate. According to the parliamentary initiative, all news-based channels will be available on every single cable network which the president called a “progressive” decision in terms of ensuring media accessibility during the pre-election period. “If someone tries to present Georgia as the country with autocrats… the response will be: where are limitations in Georgia? Everyone can express their own opinion,” Saakashvili said, wishing that the voters would make self-informed choices at the elections. Stressing the trustworthiness of the state institutions, Saakashvili said that any attempt of falsification the election process and bribing would be strictly punished by the law. “For the last 8 years we have built the system according to which everyone should obey the supremacy of law,” he told the regional and self-government representatives with pride that the state institutions in Georgia would oppose any violation of the law. Saakashvili supposed that “certain forces” would try to misinform the public about the activities of the local and regional leaders, but suggested that the protection of the free choices of people would be the best option for discrediting the lies. Stressing that no one would manage to “buy” the country’s democracy, President Saakashvili stressed that no political forces, including the ruling United National Movement (UNM) should have an influence on the voters' choice by misusing administrative resources. He said by following the course defined by his administration, Georgia has a real chance to become a member of NATO in 2014, as well as bring success to each and every Georgian family and fulfilment of their hopes. Political analyst Zurab Abashidze, said the president’s messages are sent and who and how people will follow them will become known in near future. He said the government would always have more financial levers than any wealthy oppositionist. Emphasizing the importance of the upcoming elections for Georgia-NATO relations, Abashidze said that if the elections will be qualitative, Georgia would have “more power and right” to approach NATO. “I see it, the government and its main oppositional power consider integration to NATO as their main foreign priority,” Abashidze told The Messenger, referring to Bidzina Ivanishvili’s Georgian Dream party. However, he said Georgia’s aspiration to NATO doesn’t only depend on Georgia’s will.